‘permitted work’ – work you are allowed to do while you are on Employment and Support Allowance (ESA). Permitted work can include paid employment or self employment. Permitted work is work you may do if you get Employment and Support Allowance. The briefing attached to this page gives information on how it works and gives guidance on what happens if you earn more than the earnings limit as part of a natural cycle of work. If you are claiming Employment and Support Allowance (both Work-Related Activity Group and Support Group) you can work under 16 hours a week and earn up to £131.50 a week. This amount is the equivalent to 16 hours paid at the National Minimum Wage. You must talk to Jobcentre Plus before starting any permitted work. They will send you form PW1 to fill in and send back to them. You will not receive ESA if your earnings exceed the £131.50 limit though earnings can be averaged over a 5 week period where there is a natural cycle to the work. If you get Housing Benefit or a reduction in your Council Tax, you must also tell your local council before you start permitted work, as it could affect your benefit or Council Tax. If you are claiming ESA and are on housing benefit or council tax benefit you are allowed to keep all your permitted work earnings. Earnings from permitted work will not affect your benefit. work done as a councillor. If you receive a councillor’s allowance that pays more than £104.00 a week (excluding expenses), an amount equal to the extra money will be deducted from your contributory employment and support allowance, incapacity benefit or severe disablement allowance. self-employed work done whilst you are 'test trading' for up to 26 weeks with help from a self-employment provider arranged by Jobcentre Plus. 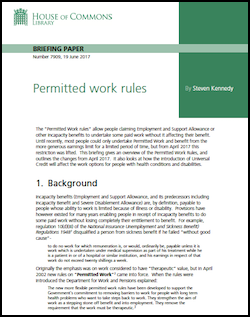 Universal Credit removes the distinction between in-work and out-of-work support so the permitted work rules are replaced with work allowances and a taper rate of 65%. The Universal Credit work allowances for people with limited capability for work are £503 per month for those with no housing costs and £287 per month for those with housing costs. Once a person is earning more than their work allowance a taper rate of 63% is applied to their remaining earnings, reducing the amount of UC that they receive. You can volunteer as many hours as you like while getting benefit, as long as you keep to the main benefit rules. You must tell Jobcentre Plus before you start volunteering. You must not be paid money or anything else for volunteering. It’s okay to be paid your expenses, but you must tell Jobcentre Plus what you get and hold on to any receipts. Any money you get on top of expenses may be counted as earnings, and affect your benefit. you work for a charity or similar group.